GREETINGS FROM OUR SOLAR POWERED OFFICE: At this writing, we are working on our grid-tie office system that will add a 5.5KW array here, utilizing Sanyo solar modules and a new battery-based grid-tie inverter. Stay tuned for pictures and information! For those of you who aren’t “on line”, or are beginning your project, we have an extremely informative Product Catalog on disc for $10 ($18 out of country)—essential for your energy library! Products, system sizing, pricing, components, importance of energy efficient appliances, battery care, and wind turbines are just some of the topics covered. If you are on-line, you can see example systems at www.oasismontana.com/systems.html. To assist your information input, we’ve tried to develop as much on-line information as we can. For solar water pumping, see www.PVsolarpumps.com; for utility-tied photovoltaic systems, visit www.grid-tie.com; for efficient AC appliances, DC ’fridges, coolers and freezers see www.eco-fridge.com; for natural and LP gas appliances, see www.LPappliances.com; we now offer composting toilets at www.eco-potty.com and our main page is www.oasismontana.com. Visit our web pages and stay a while! 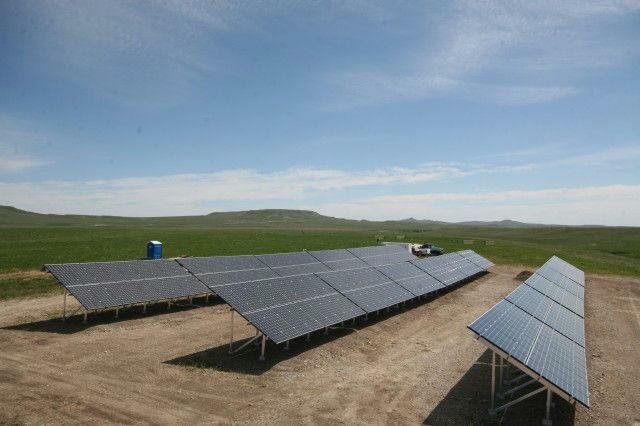 Our latest summer project in north central Montana’s Teton County features Sanyo solar modules and Fronius grid-tie inverters. 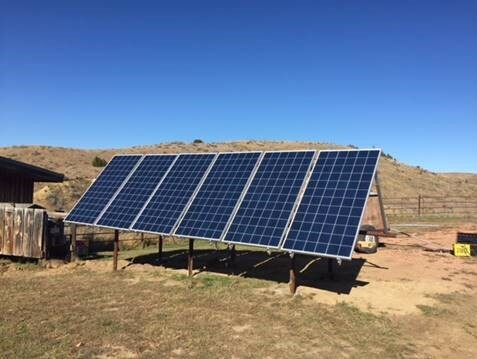 The 69.6kw array is providing power for the local ranch and works in conjunction with the Sun River Electrical Co-op. Oasis Montana would like to thank our progressive customers, Teton Electric, and Simple Power and its crew for what is currently Teton County's largest grid tie solar array. To design a power system for you, we need your power requirements (electrical load information). See our web page for system sizing information and examples of power systems, which are based on the part of the country you’re in and how much sunlight you receive. We have design information on our web site, so please feel free to utilize this. Or, we also offer a product and design information CD for just $10.00 ($18 international)-—filled with information for your energy library! We also have a paper catalog, which costs $15 for U.S. residents. 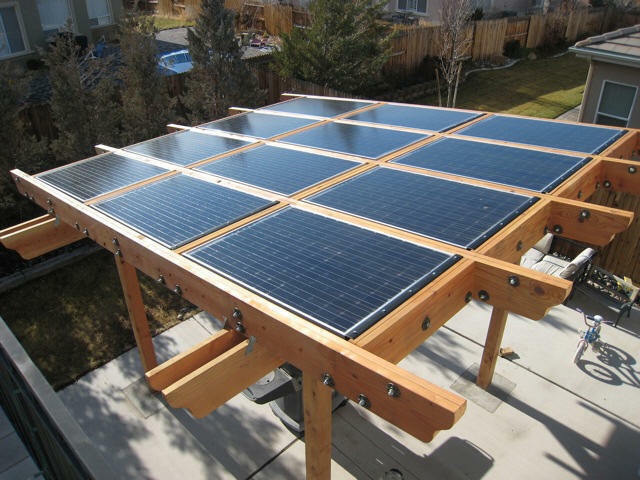 You’ve decided to make the investment and put some solar up on your home’s roof. If you are like most people, you hate the thought of spending your hard earned dollars on something and not even knowing for sure what it’s doing up there. Is it on? Is that once immature spruce now beginning to lay its shadow on the array? Is it doing what it is supposed to be doing? Or, perhaps you wish that you could more easily share your exciting addition and your move to a more sustainable lifestyle with friends, family or even your child’s school. producing power for you safely and efficiently. In addition to performance monitoring, their hardware will communicate directly with your inverters so that any warnings or errors will be reported to your installer promptly—thereby allowing us to preemptively correct any possible problems . DECK also offers a professional grade weather station that includes wind, air temp, cell temp, humidity and insolation instruments that also have the ability to upload all of its data to your website. With this weather installation both you and your installer can look back and see if indeed your system was producing the power it should have given the weather conditions. Whether your PV system is on a home, business or school, you will have the added benefit of using your custom website as an educational tool. It’s a great conversation piece at the office or a science teacher’s dream lesson come true. . .spread the news of the future! If you get e-mail, GET ON OUR E-LIST! Save paper, trees, labor and postage (and disturb only a few electrons!). If we are really on the ball, you might get an e-mail from us a couple of times a year, and we do not sell or share our e-list with anyone. It’s just like our paper newsletter—except the links work! Just drop us a line to info@oasismontana.com (and do make sure that your e-mail program knows we’re not spam). The Energy Information Administration’s latest report on federal energy subsidies underreported direct and indirect federal subsidies to the nuclear and fossil fuel industries, creating an inflated view of the subsidies that benefit renewable energy and efficiency programs. The problem with the EIA’s methodology stems from the fact that the agency adopted a “snapshot” approach to measuring subsidies by only looking at a single year: 2010. By doing that, the agency failed to count the massive federal subsidies that the fossil fuel and nuclear industries have enjoyed for decades—benefits they presumably will continue to receive unless Congress acts to limit them. Conversely, relatively new subsidies for wind and other renewables will only last for a finite period—10 years—after those facilities begin operation. WHO WE ARE and ORDERING INFORMATION: Chris Daum, owner and manager of Oasis Montana, has been in the renewable energy field for 22 years. Our staff offers experience, personalized service, tech support, quality components and good pricing. 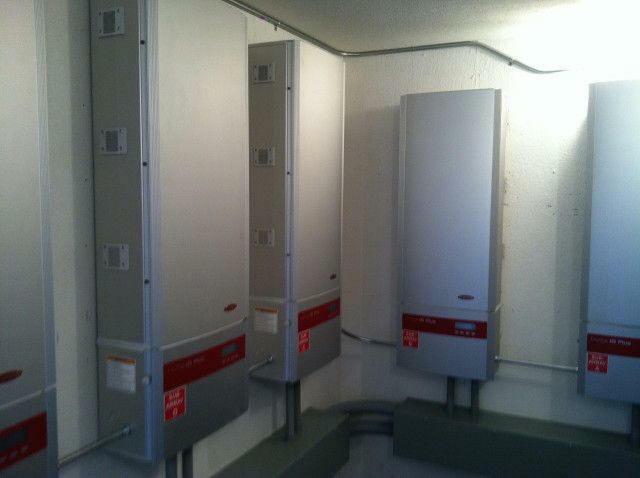 We are happy to work with your installer, electrician, or contractor, and locally we can install your power system. We provide detailed wiring diagrams with the systems we sell. TO PLACE AN ORDER: E-mail or call us for your freight; if you have any questions about your system or product, please contact us. E-mail is easiest and fastest (but we know that you aren’t all on line). We accept Visa/Mastercard (personal and business checks are fine). For our international customers, we accept bank transfers— e-mail or call us for our banking information. Our winter hours are 8:30 am to 4:30 pm Mountain Time, Mon. – Fri. If we‘re on another line when you call, please leave us a message, and we’ll get back to you as soon as we can, but you may have to leave a message if we’re with a customer or on one of the other lines. 406-777-4321 or 4309 or e-mail us at info@oasismontana.com — for tech support on renewable energy systems, e-mail larry@oasismontana.com. We’d be very happy to help you with your power project — send an e-mail or give us a call! BACK UP POWER FOR YOUR REFRIGERATOR (or, what do you need to run when the lights go out?) Our DC refrigerators and freezers by Sundanzer are among the most efficient DC appliances available. They will run off of a 12Vor 24V battery bank, and their low power requirements won’t break the bank when it comes to a DC system to run them. A system to power the DCR225 (their 8 cu.ft. freezer) at an ambient temperature of 90 degrees Fahrenheit might entail the following: a 180W solar module, charge controller, wire runs, solar module mounting bracket, four 6V golf cart batteries, battery cables, and the freezer itself for a total cost of right around $2800, before freight. 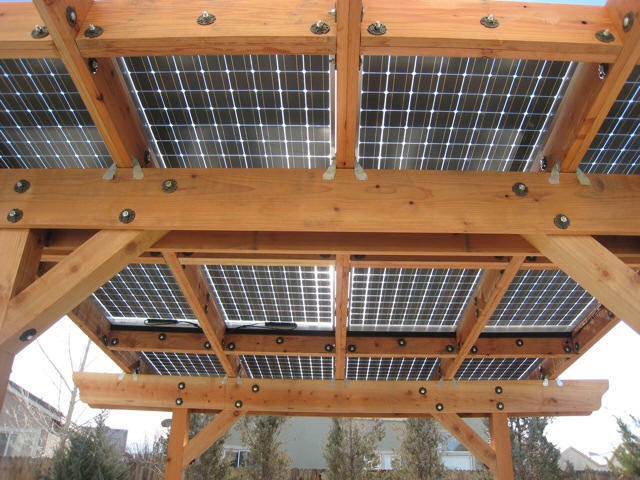 SOLAR MODULE PRICING—call for availability, freight costs, and quantities (# of modules) on pallets for the best deal. You can’t get less than a pallet quantity to get the pallet ‘deal’. For larger modules, pallet quantity generally runs between 20 and 40 modules, and oft times there are significant additional charges for less than pallet quantities. Module make & pricing is still fluctuating; call for current availability and pricing. Disclaimer; prices subject to change without notice. Sometimes for the better! Water Facts: Less than 1% of the fresh water on earth is potable. The world’s people (now approaching 7 billion) are appropriating 54% of all the fresh water contained in rivers, lakes and underground aquifers. By 2025, nearly two billion people will be living in countries or regions with absolute water scarcity, and two-thirds of the world population will likely be under stress conditions. How the world uses freshwater: • about 70 percent for irrigation • about 22 percent for industry • about 8 percent for domestic use. It takes 1000-3000 litres of water to produce just one kilo of rice and 13000 to 15000 litres to produce one kilo of grain-fed beef. GAS APPLIANCES: Propane refrigerators, freezers, ranges, cooktops - www.LPappliances.com for information. The Servel propane refrigerator can be converted to use natural gas for $200 (includes re-crating). 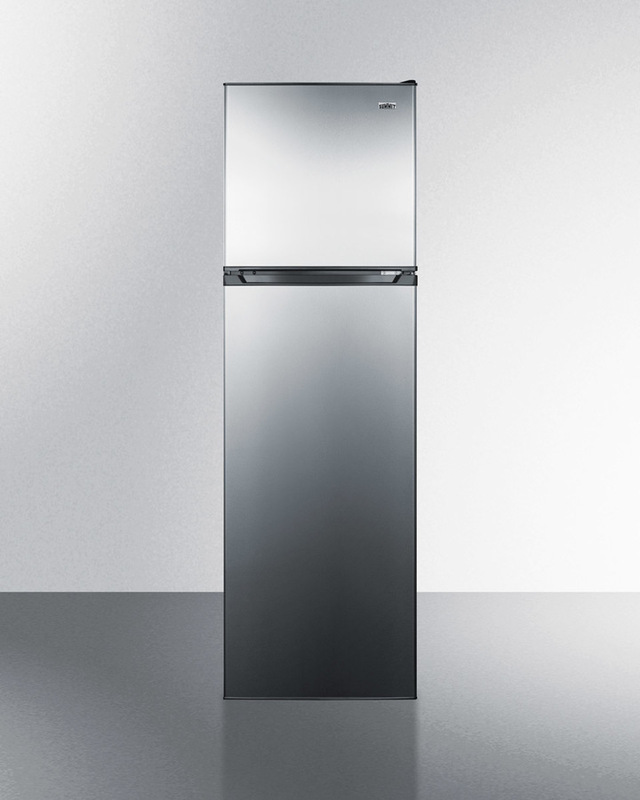 The Crystal Cold refrigerators and Blizzard 10 to 18 cu.ft. freezers can be converted to natural gas for $50; the Blizzard 22 cu.ft. freezer can be converted to natural gas for $100 (more costly as this model has two gas absorption units on it). 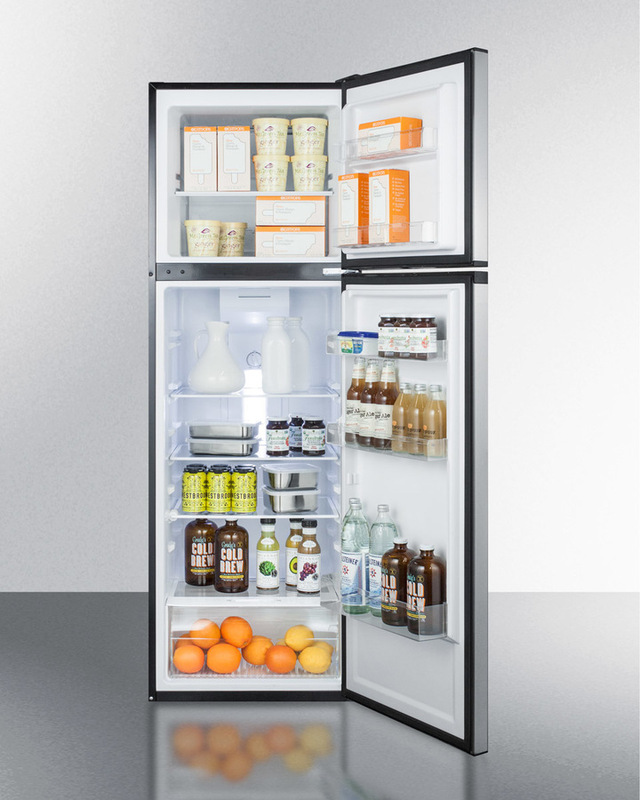 No power is no problem with these gas ‘fridges and freezers! We also offer propane & natural gas cooktops, Italian-made by Verona; these professional cooking appliances are available in a wide variety of finishes (stainless, black, bisque and black glass), with two, four and five burner models. Visit www.LPappliances.com for pictures and specifications. CONTROLLERS & REGULATORS are essential for complete battery charging while preventing overcharging. Sizing a charge controller is based on the input amperage and voltage of the solar array. NEW Sunsaver Duo 12V 25A (charges two batteries,w/ display & LCD) --great for RVs! We can provide most brands of solar charge controllers, from Blue Sky Energy (formerly RV Power Products) to Specialty Concepts. Call us for availability and your pricing. 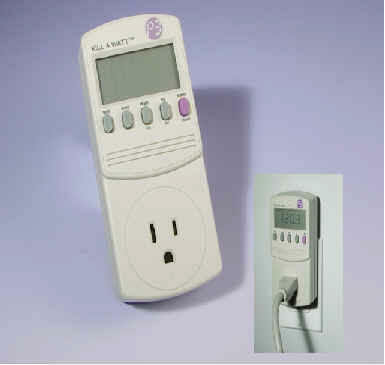 Kill-A-Watt Meter: This electricity detector and monitor can educate you about your monthly electric bill and help you save a lot of money. You can now be a ’detective’ and ascertain what appliances are actually worth keeping plugged in. Simply plug in the Kill-A-Watt meter, connect your appliances to it and Kill-a-Watt will assess how efficient it really is, showing you the instantaneous power used, and also cumulative energy or kilowatt-hours used. Kill-a-Watt, with an easy-to-read LCD display, will count consumption by the kilowatt-hour, same as your local utility. With the help of Kill-a-Watt you can figure out your electrical expenses by the day, week, month or year on a given device. Kill-a-Watt can check the quality of your power by monitoring Voltage, Line Frequency, and Power Factor. Still just $29. THE IMPORTANCE OF WATER AND WATER PUMPING: In these days of droughts, floods, tornadoes, other weather anomalies that cause power outages, we may be able to do without a lot of creature comforts but one thing we all need is clean water. Earlier this year saw much of the U.S. inundated by snow, followed by heavy spring rains, while many in the southerly climes haven’t had a decent rain in a year or more. Here at Oasis Montana, we have a particular focus on water pumping for sites without power, or to provide reliable back-up in the event of a power outage. While most of our pumping systems are out here in the western U.S. (for remote homes, livestock watering or protecting riparian areas), we have systems and happy customers all over the world. There are a variety of pumping systems to meet differing needs; here are three of them, one for high volume shallow pumping requirements, one from a depth of ~200 ft., and one deep well system example that’ll pull water from 650 ft. depths. Costs do not include freight, pump wire, conduit, labor/installation, concrete, etc. The systems, above, will start pumping when the sun comes up and stops when the sun goes down. For utmost efficiency (and more water), these systems do not include batteries. If you need water on demand there are other options for having water available 24/7. If you think you have a solar water pumping project in your future, get us the answers to the questionnaire at www.PVsolarpumps.com and we will propose a system for you! Oasis Montana welcomes our newest sales technician, Larry Keogh: with a long term addiction to energy production and conservation, having been initially trained on military generators in 1971 and “fooling around” with PV since the mid 1980’s, Larry obtained an AAS in Energy Technology from the University of Montana, College of Technology in May of 2010. Formally educated in solar, wind, wave, tidal, coal, hydro, geothermal, other energies and storage, and coupled with decades of life experience in electrical work, and being a long term “energy conservation nut”, Larry has the tools and experience to help you gain the edge on sustainable energy for your home or business power project. For battery based systems: The new MATE3 system display and controller from Outback Power expands the capabilities of the old MATE by providing data logging, internet viewing of the data, and improved tactical buttons for easier programming and monitoring. Also, the ability to insert an SD (memory) card allows for easier system upgrades and expanded data logging possibilities. The hard and soft buttons are easier to distinguish from each other and there is a control wheel for establishing set points. An example of one issue many users have with the old MATE is that it requires simultaneously “double pushing” the two buttons on the left side of the mate to get back to the main screen but if you don’t press them just right (common for people with big fingers!) then you get sent to another screen which could cause the user to input the wrong set points. The MATE 3 eliminates this problem with the much easier-to-use hard and soft keys. By allowing data logging, the MATE 3 is no longer just a place to adjust set points and carry out an equalization of your batteries. Using graphs to display the history of the batteries state of charge from the systems different charging sources as well as how much power was used and back fed to the grid (for their grid tie inverters) the MATE 3 expands the owner’s knowledge of how their system is performing. This knowledge is beneficial because it helps the owner understand how to manage the system properly. Also, because it is on-line it will be easier for the system installers and Outback tech support to help troubleshoot problems a customer may have or double check the set points for the system, ultimately maximizing the health of the batteries and increasing the overall lifespan for the battery bank. A built-in clock and calendar function enables timer-based programming of inverter and charger operation. This permits you to set the system to work with time-of-day power rates or to limit a generator’s run time to a specific time period of the day or week. All of your settings are stored in permanent memory to eliminate the need to reprogram in the event of a system shutdown or battery replacement. The MATE3 is an Internet enabled device — simply connecting to the Internet will allow full remote system monitoring via an easy-to-use web interface. With these new upgrades Outback Power brings a new MATE to the market that many of us have been wanting for years. Because off-grid systems require the owner to be more interactive with the system than grid-tie systems do, the MATE3 is a good investment for the Outback owner. The more an off-grid owner monitors their system and understands it the happier they will be with the system. Since the MATE3 is easier to use and understand, it is easier for the owner to interactive with a system and be able to see if they are living within their system’s capabilities which leads to improved load management and longer battery life for them as well. 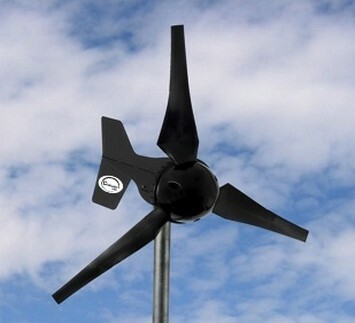 Coming soon….Bergey’s XL.1 wind generator to be available in 48V. Other features include electric brake, 60A dump load, timed battery equalization, watt meter display mode, and a solar controller that can accept up to 30A of PV. Tubular tower kits are available in 60, 80 and 100 ft. heights. Visit the manufacturer’s web page at www.bergey.com or call us for more information on these battery charging units. Prices for the wind turbine, controller and tower kit generally run between $5500 to $8500, depending on site specifics. The first and last wind turbine you will need to install at your high wind site! www.orphanstoambassadors.org is a non-profit organization that works to help orphans by education, fighting poverty, promoting sustainable and environmentally benevolent technologies to give children a safer, cleaner and brighter future. Jake Gentry (at center, below left) has used PV equipment from Oasis Montana to provide potable water and electricity for the orphanage and school. Kudos to our friends and their great work! The older children are taught the basics of solar power and help do the installations. The picture at the far right says it all! 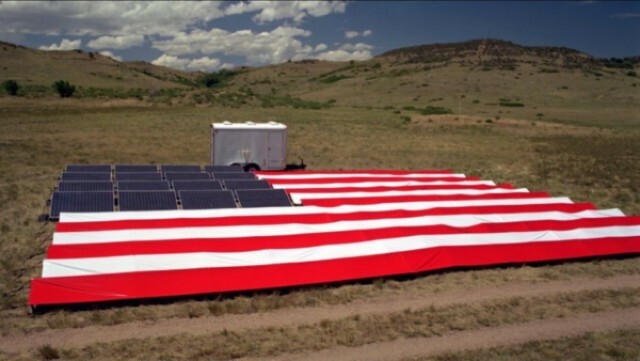 “If you can’t sell them sun power, sell them shade…..” Solar patios and car ports are becoming more popular, where a sunny location can provide much-needed shade and power. 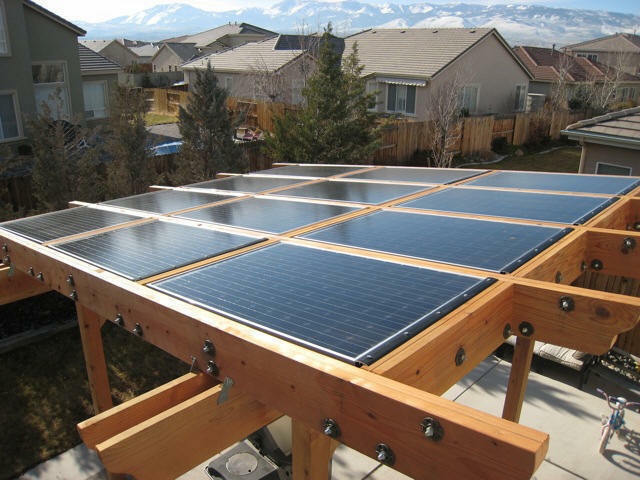 The solar porch (pictures to the left and right) has a dozen solar modules, making clean energy for our customers in Reno, NV. =Original-Member. The deal to extend the debt limit is certain to evolve into a clash between those who think the older but more proven energy forms should lead and those who espouse the growth of newer and cleaner fuels. Indeed, the final bargain allows the $14 trillion debt ceiling to be lifted by $2.4 trillion in exchange for about a $2.7 trillion in budget cuts over the next decade. And while those reductions have not yet been defined, concern is brewing in environmental corners that they will come out of the monies given to the green sector and the regulatory agencies set up to limit pollution levels. The conventional thinking is that some of the funds provided to wind, solar and fuel cell technologies will get sliced. To be fair, that would then need to be accompanied by a relative reduction in subsidies given to oil, coal, natural gas and nuclear, or perhaps the raising of their taxes. So the big questions are whether they will be fairly distributed across all energy fields and whether the regulators will have the resources they need to do their jobs. University Researchers Say 100% Renewable Energy Indeed Possible: In a paper published in "Energy Policy," Mark Jacobson (professor of civil and environmental engineering at Stanford University) and Mark Delucchi (University of California-Davis) assess the costs, technology and material requirements to convert our society to renewable energy. 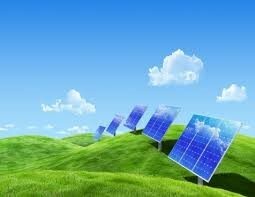 They conclude that the world can be powered by renewable energy in 20-40 years - using technology available right now. All new energy generation could be renewable by 2030, and all pre-existing energy production could be converted to renewables by 2050. http://www.sustainablebusiness.com/index.cfm/go/news.display/id/22215 for this article. ...Report Finds Renewable’s Growth Is Beginning to Outpace Coal, Nuclear: http://www.nawindpower.com/naw/e107_plugins/content/content.php?content.8264 The installed capacity of wind and solar power grew faster than that of any other power technology, according to a recent analysis of the global power plant market released by Greenpeace International. In addition, renewable energy reached its biggest market share in 2010, providing enough capacity to supply electricity to the equivalent of one-third of Europe. The report also highlights how renewable energy plants accounted for more than a quarter (26%) of all new power plants added to the worldwide electricity grid over the past decade, compared to nuclear power stations, which represented 2% of new installations in the same period. The report shows that while the global wind industry added approximately 35,000 MW of capacity in 2010 alone, it took the global nuclear industry from 2000 to 2010 to achieve this. During the same period, new coal installations went into decline in every country except China. ...All 50 States See Record Temperature Highs in July: http://www.firstenercastfinancial.com/news/story/44171-all-50-states-see-record-highs-july- According to data from the U.S. National Climatic Data Center, the July heat wave, lasting weeks in some cities, the entire month in others, affected nearly 200 million people in the United States at some point. Preliminary data show that 2,712 high-temperature records were either tied or broken in July, compared with 1,444 last year. At least one weather station in all 50 states set or tied a daily high temperature record at some point during July. The city of Morehead, Minnesota had the dubious distinction as the hottest place on Earth for a day. On July 19, the heat index there was 134 F. In the U.S. the heat wave has claimed over 700 lives and hospitalized thousands. ...A new report, "Sizing the Clean Economy," published by The Brookings Institute and Battelle, offers what they bill as a first-ever look at current green jobs figures. There are about 2.7 million jobs that fall under the report's definition of green jobs, and they span a wide range of industries and sectors, from public transit to organic food and farming to smart grid. That's more workers than are currently in the fossil-fuel industry. The clean economy is manufacturing and export intensive. Roughly 26 percent of all clean economy jobs lie in manufacturing establishments, compared to just 9 percent in the broader economy. 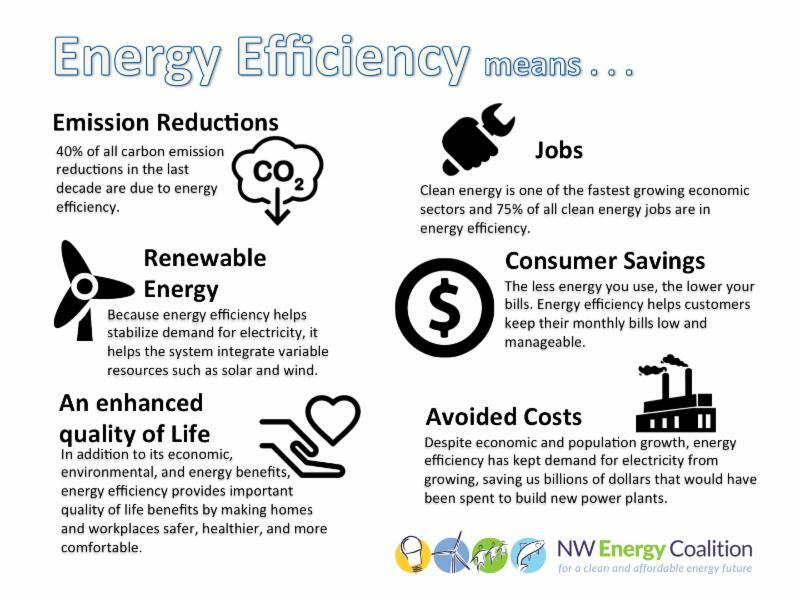 The clean economy offers more opportunities and better pay for low- and middle-skilled workers than the national economy as a whole. The clean economy permeates all of the nation's metropolitan areas, but it manifests itself in varied configurations. More than 40% of this year’s US corn harvest, about 5.05 billion bushels, is expected to be used to produce ethanol. That surpasses an estimated 5 billion bushels that will be used for livestock feed. This is the first time more corn has been used to produce ethanol than to feed cattle, pigs, and chickens. Corn prices are about 90% higher than they were a year ago amid demand from ethanol producers. But demand for corn has also risen world-wide, as developing countries continue economic growth and demand for meat by consumers also grows. How much of the price of corn is attributable to the US-mandated demand for ethanol is certainly arguable. Under current utility electric vehicle tariffs, it is always cheaper to recharge an EV than to fuel a conventional gas-powered vehicle, according to a new study released by Northeast Group, LLC. The study benchmarked and analyzed the first wave of EV-specific tariffs launched by electric utilities across the United States. In the most likely EV charging scenarios, costs were approximately one-tenth to half the costs of fueling a conventional vehicle with gasoline. The study, "United States Smart Grid: Utility Electric Vehicle Tariffs," includes a benchmark of the EV tariffs of ten different utilities in six different US states. The cost analysis looked specifically at "fueling" expenses, and did not consider other operating costs of vehicles. DID YOU KNOW….? The use of electronic products has grown substantially in the past 20 years. 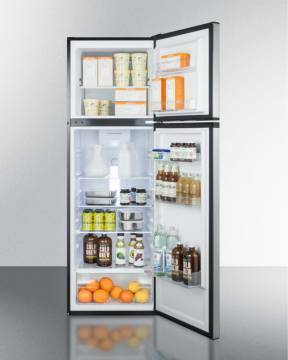 Here are some interesting facts from the Edison Electrical Institute: > DVRs use as much energy in one year as a refrigerator. > PCs and TVs now account for 10% of a home’s electrical usage. > 99% of these products must be plugged in or recharged. > 42” plasma TV uses more than twice as much as a standard 27” TV; so if you can put these on a power strip and turn them off when not in use, that’s the way to go. Pretty much any items that have ‘instant on’ are using power even when off! Feel free to forward this newsletter to your friends and colleagues. Knowledge is power.